This paper examines Crossrail’s concept of establishing and implementing a management system that ensured that all key processes were mapped, describing the approach taken and setting out how the Management System was developed. It discusses the challenges encountered throughout the lifecycle of the Programme and how best practice and lessons learned from previous projects of similar scale were used in its development. It identifies the processes and procedures that were adopted for the delivery of the Crossrail Programme. In doing so it provided assurance to Sponsors and Infrastructure Managers (IM’s – future operators of the railway) that the programme was being delivered coherently and correctly. This paper will be of interest to other major projects and any project professionals looking to set up an organisation wide management system. The Crossrail Management System (CMS) was designed to set out and mandate the processes and procedures that were adopted on a corporate level and for the delivery of the Crossrail Programme. Its intent was to provide assurance to Sponsors, (through the Project Representative), and Infrastructure Managers that the programme was being delivered coherently and correctly. The CMS was developed to meet the requirements of BS EN ISO 9001 (Quality) , BS EN ISO 14001 (Environment)  and BS OHSAS 18001 (Occupational Health and Safety) . The aim was to develop a system that would be an easy to use online system, utilizing a web portal to access the current management system documents. The management system changed continuously from the start of the Crossrail Project. In order to understand its evolution the various criteria that affected the management system have been examined. Although some of the criteria remained fixed, the majority were subject to change. This created challenges with the development and maintenance of the CMS due to the high number of internal and external stakeholders involved. 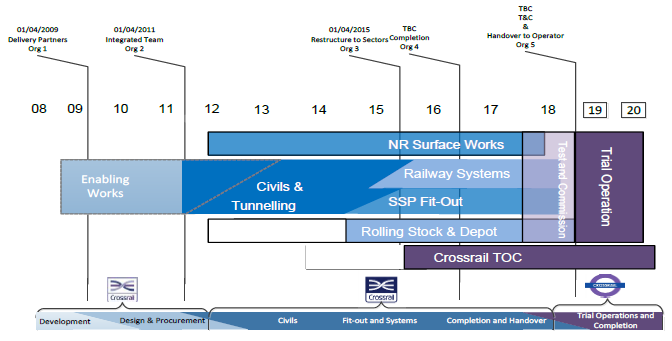 Figure 1 below sets out key stages along Crossrail’s timeline and recognises the respective organisational changes, these could then be reflected with updates to the management system. To understand how the CMS was developed it is important to be familiar with the organisations influencing Crossrail. CRL has two Sponsors – the Department for Transport (DfT) and Transport for London (TfL). The project organisation is accountable to both Sponsors in terms of its performance for delivering the Crossrail programme. Both Sponsors are represented on the Sponsor Board which is supported by the Joint Sponsor Team (JST) comprising representatives from both the DfT and TfL. The Sponsors have also appointed a Project Representative (P-Rep) to provide them with advice and information on the progress of the project. The Crossrail Bill received Royal Assent in July 2008, becoming the Crossrail Act 2008. The Crossrail Act gave the Secretary of State for Transport powers to acquire land, and to construct and maintain Crossrail. The Crossrail Act places requirements on CRL through the ‘Undertakings’ to Parliament and petitioners, and ‘Assurances’ made to petitioners and generally. For example, one of the “Undertakings” was that the Secretary of State would require CRL to comply with the Environmental Minimum Requirements (EMR), a suite of documents including the Crossrail Construction Code which defined constraints on noise, dust, settlement and other matters. In December 2008 the Sponsors Agreement, Transport for London (TfL) Shareholder Agreement and PDA were signed. These agreements governed the relationship between TfL and the Department for Transport (DfT) as joint Sponsors, which regulated the composition of the CRL board and set out CRL’s obligations. The PDA between Crossrail Limited (CRL) and its Sponsors appointed CRL as the legal entity accountable for the management and implementation of the Crossrail Project. The PDA prescribed how the Sponsors engaged CRL to deliver Crossrail. The other requirements that needed to be considered were the On Network Functional Requirements (ONFR). These were specifically for the existing surface sections of Crossrail being modified by Network Rail. Sponsor’s Requirements Section 2.2 – “quality assurance, environmental assurance, safety and security regimes shall be established to be implemented during the phases of design, construction, commissioning and service operation”. The requirements of this objective will be examined further in the later section of this paper entitled ‘Compliance with Quality, Environmental and Safety Standards’, (section 5.4.3). The parties who already operated or maintained the infrastructure and facilities that formed part of Crossrail: Network Rail, London Underground and Rail for London (RfL), have requirements to enable them to accept the railway in order that they can operate and maintain the completed project. London Underground in particular had both technical and process requirements which CRL needed to fulfill. 2.5 The Agreements Between CRL and its Industry Partners. There are many agreements that set out the relationships with, and responsibilities of, the Industry Partners. The primary agreements are listed below. In developing the management system one of the important aspects was the consideration of the structure of the CRL organisation. This is one of the elements that evolved throughout the CRL lifecycle. CRL created an integrated management structure in order to embed a “One team, One target” ethos. This was intended to drive behaviours and create ways of working that characterise success for the programme. Over time the size and structure of the organisation continued to evolve to suit the nature and stage of the project works. Each major phase of the project works required a different approach from CRL’s management and delivery teams. 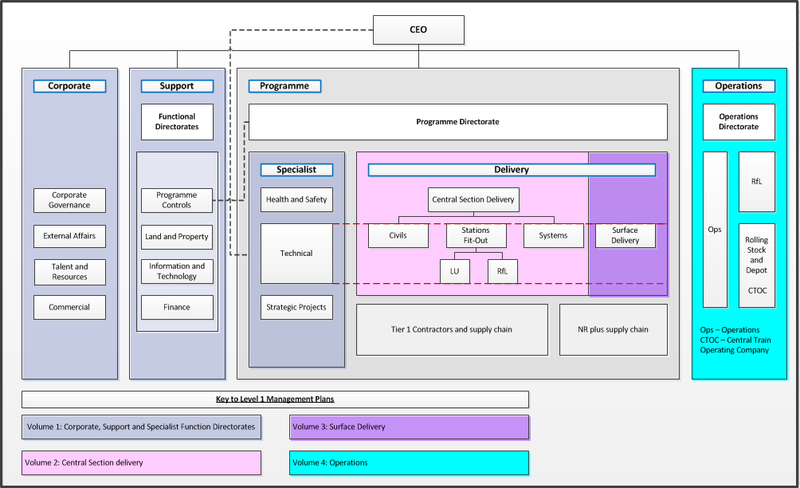 CRL adopted an overall programme management structure to organise, manage and co-ordinate the delivery of each of the different elements of Crossrail. This matrix management approach is in line with the PDA and provides sufficient flexibility to deal with the ever changing scale and complexity of a major project delivery environment. Details of the directorate structure and teams are governed by their respective management plans which shall be discussed in the CMS Documentation section later in this paper. The division of responsibility is illustrated on the organisation chart shown in figure 2 below. Under the Chief Executive the organisation was split into 4 functions, Corporate, Support, Programme and Operations and the respective directorates are shown in each of these groups. It was apparent that the majority of key processes were a series of interconnected work streams, with information flow, that cut horizontally across the Programme. It was therefore a necessity to develop and implement efficient processes across organisational boundaries. Good examples of this are the Assurance and the Risk Management Processes. The Assurance Process is detailed in the Delivery Strategy (Section 6.10), the Programme Assurance Strategy, and the Technical Assurance Plan (TAP). The Risk Management Process and associated documents are detailed in the risk management section of the Learning Legacy. These core processes incorporate well defined and developed steps that produce defined outputs from a variety of inputs. The processes are aligned with their strategies, enabling related activities to be effectively combined. To raise the profile of the importance of mapping key processes, top management bought-in as process owners. They took real authority and responsibility for process development, operation and performance measurement. Functional Heads were key in the success of this as they held ultimate authority and responsibility for controlling process implementation and were fully accountable. Leadership skills were also crucial as it was necessary to communicate and influence relevant parties in order for the successful adoption of processes. Throughout the lifecycle of CRL it was important to define the processes and ensure that they were aligned and documented. As well as using the process approach to identify and map key activities throughout the Programme it was necessary to also carry out process definition. This involved specifying, defining and mapping the process to ensure that assurance requirements were addressed for each stage. Once the processes had been defined process maps were developed. This approach was used successfully throughout the CRL programme and has proved particularly useful when carrying out root cause analysis as part of the non-conformance process. Where there is a defect or nonconformity (i.e. non fulfilment of a specified requirement) in a part of the works, activity or process, a non-conformance report (NCR) is raised in accordance with the Project Technical Request (RFI-NCR-FCD) Procedure . As part of this procedure, root cause analysis is carried out by mapping the process to identify the stages at which a problem is caused, ultimately highlighting the root cause of the problem. How this was developed and introduced is outlined in the Quality training paper. 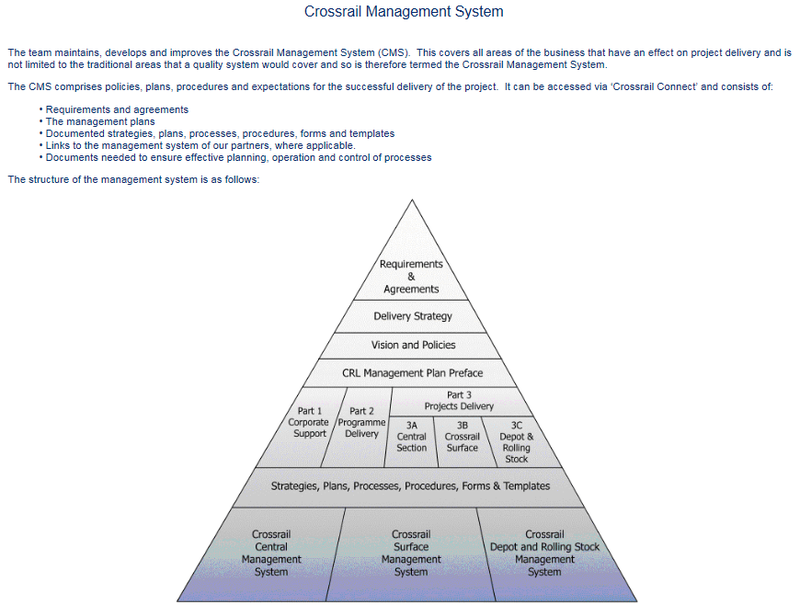 The Delivery Strategy is Crossrail’s primary management document which is supported by the CMS, represented hierarchically in Figure 3 below. It sets out the manner in which CRL propose to deliver Crossrail. In addition it provides the common definition of the Crossrail Project, its purpose and structure for everyone and every organisation, particularly CRL’s staff and its Industry and Delivery Partners, involved in the delivery of Crossrail. It sets out Crossrail’s model for governance, identifying scope, objectives, what has to be achieved and the main risks to those objectives. It demonstrates that CRL has in place the organisation, strategies, controls and resources to manage Crossrail as a whole, to successfully achieve Substantial Completion, Final Completion and Handover to the Operators. 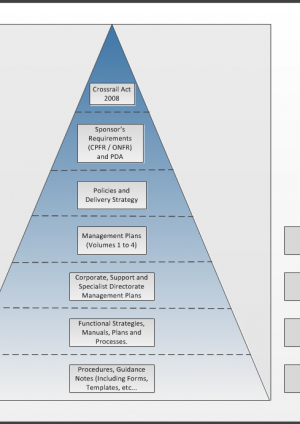 The CRL management plans (Volumes 1 to 4) are the top level plans, (in other organisations these may be referred to as manuals), which provide a description of the organisation and manner in which CRL implements its Delivery Strategy in order to meet the Sponsors Requirements for Crossrail. Beneath these the functional strategies, plans, processes, and procedures describe what is required in order to deliver the design, construction, testing, commissioning and trial operation phases of Crossrail. These documents will be discussed later in this paper. In the early stages it was important to look at lessons learned from previous contracts and gauge the volume of documentation that would be required to fulfil the requirements for CRL. This was done by comparing CRL with a similar mega project, the Channel Tunnel Rail Link, also known as High Speed 1 (HS1). This cost £5.8 billion to build and was completed in November 2007. It proved to be an excellent model providing many principles adopted by CRL. Copies of the HS1 management system documents produced by Union Railways (the Client) were acquired for reference. This documents the governance arrangements and references corporate function, support function and programme specialist management plans. This mandates how the Crossrail central section delivery directorate manages the central section which comprises of the central section works by contractors engaged directly by Crossrail and other works by the Delivery Partners. This mandates how the Crossrail surface directorate manages the surface works which comprise the “On Network” works undertaken by Network Rail and other work by contractors engaged directly by Crossrail. This describes elements of the Crossrail project for which the operations directorate was accountable, including the delivery of the rolling stock, depot and associated services and working as RfL’s agent to manage the delivery phase. 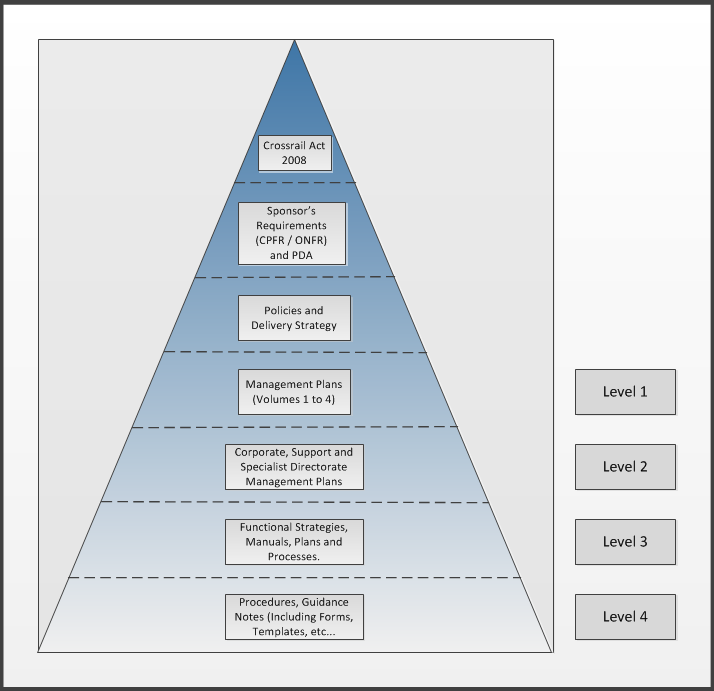 The corporate, support and specialist directorates referred to within the Volume 1 management plan established their own management plans at Level 2. These directorate management plans provide further information relating to the organisational governance and the structure of departments within the respective directorate, outlining how the directorate interfaces with other directorates and functions engaged on the project. These also explain the accountabilities, roles, processes and procedures of these functions. Within the surface and operations directorates and due to the nature of the contracts there was a different approach and project management plans and execution plans were produced by the project teams. Level 3 documents comprise the functional strategies, manuals, plans and processes that describe what is required in order to deliver the design, construction, testing, commissioning and trial operation phases of Crossrail. At this level it was noted that the processes had been carefully examined and that some of them, for example the assurance and risk management processes involved more than one directorate. RAM Plan (Reliability, Availability and Maintainability). Level 4 documents comprise procedures, guidance notes, forms and templates etc… These are generally detailed instructions of how to carry out an activity step by step with associated proformas / templates. The same approach that was applied to the production of the Volume 1 Management Plans was adopted for the production of Volumes 2, 3 and 4, with each of their Departmental Teams writing the documents to control their respective processes. This lead to a complete CMS catalogue of documents (as at April 2016). The CMS is a document access portal originally created as a Visio model. Documents were accessed via selecting the relevant box, as shown in figure 4 below. The improved access portal, whilst still in Visio, was developed into the process model shown in figure 5 below. Documents were accessed via links in the respective boxes. The CMS portal was redeveloped into an online application as the Visio model could not be developed any further. The new CMS uses a web portal for displaying and accessing the latest approved revisions of management documentation (i.e. policies, plans, processes, procedures etc.). This was advanced with the IT Team having the freedom to use their tools to create an effective system and using the criteria defined by the Management System Manager. The portal is easy to use and the documents are stored in Enterprise Bridge (eB), the CRL electronic document management system. Here these controlled documents are managed and their status controlled using an electronic review and approval process via the eB application. 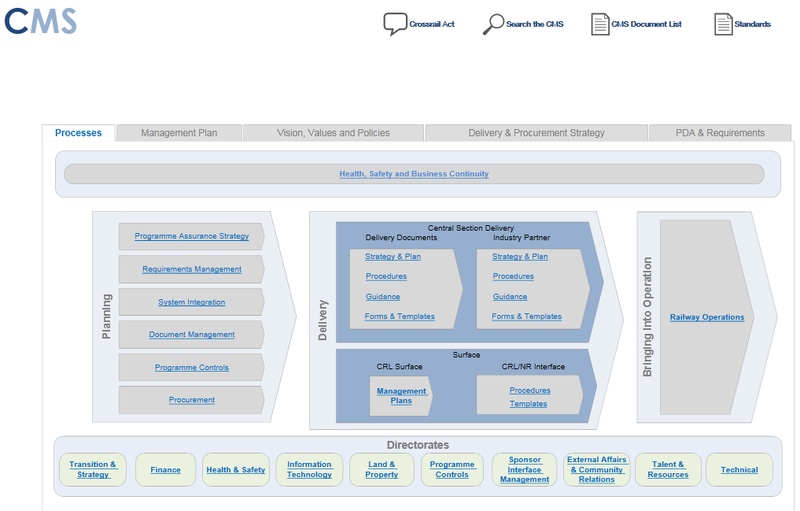 The CMS portal shown in figure 6 below was developed to mirror the CRL organisation. Documents are listed by department within the organisational groupings. Documents are locatable in two ways, text or numbers can be entered into the search CMS box at the top of the screen as seen in figure 6 above. 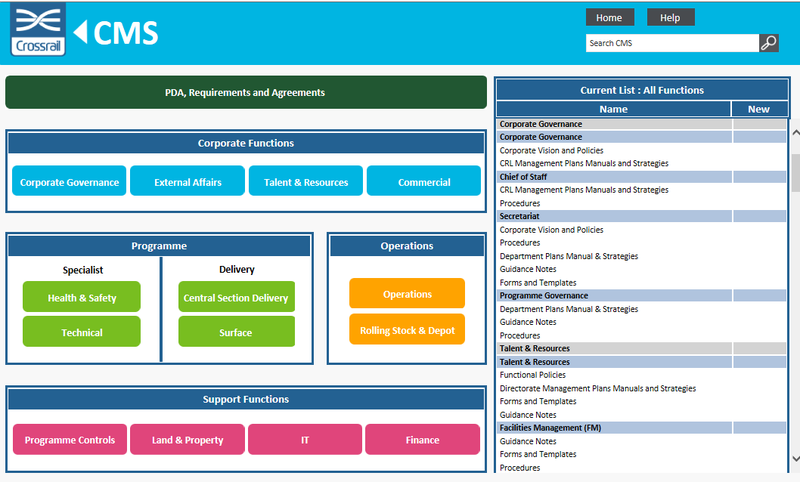 Alternatively the relevant part of the organisation can be chosen and then a list of associated departments and their documents appear from the search results in the “Current List” area shown on the right hand side of figure 6 above. Within this “Current List” area any of the lines returned can be selected showing the respective document. Finding a CMS Document demonstrates how the CMS can be used to find a document. Management system document review and update is carried out to ensure documents are current and in alignment with other documents and with the organisation. In the CMS procedure it is defined that documents are to be reviewed after significant departmental or process change or every 2 years as a minimum. Any documents that are no longer current or have been superseded are removed from the CMS. The CMS procedure was reviewed a number of times to fine tune the various activities. The Key Stages of the CMS Procedure outlines the final version. It was decided that a CMS coding system replicating a virtual structure should be used to enable easy searching for documents in the Electronic Document Management System (EDMS). This code is unique to the document location and can easily be amended if the organisation changes. The unique code refers to a specific location and enables precise management of documents within the CMS. The ‘CMS code’ (created from a virtual structure) is further illustrated in Finding a CMS Document. As per the requirements of ISO 9001:2008 a process was implemented for the control of documents. The CMS review and approval process was developed from a wet ink system to an electronic process where document links are sent to the specific reviewers who have different roles in the review process (i.e. Submitter, Reviewer, Functional Head Approver etc.) This developed into an effective ‘Work Order’ system where the people at the different activity stages would complete their ‘Work Order’ Task’ to a defined timescale. The ‘Work Order’ review and approval system is described here. The CMS review process was improved by encouraging ‘offline’ reviews to be conducted allowing the interested parties to carry out reviews outside the eB workflow system. This encouraged the teams to ‘get together’ both speeding up and making the review process more efficient. Where a new process / procedure was developed and a CMS document produced, effective communication of the process / procedure was key to its successful implementation. Briefings by process owners and CMS Contributors were carried out to those people that were required to follow the procedures. Where formal training was required, attendance records were maintained for auditing purposes. With changes / additions to existing documents a similar approach was followed. The functional head of the directorate responsible for the document was responsible for communicating changes to all affected parties. This was done by emailing users and other interested parties and information regarding the update was cascaded to others within their directorate, department or contracting organisation. In addition a list of CMS documents issued each period is published through the CRL Intranet system ‘Connect in Brief’. The methods used for CMS communication are detailed in the CMS Procedure – Key Stages. A comprehensive training programme has been established on Crossrail to ensure that staff are aware of and are equipped to follow key processes and procedures. This takes a number of formats such as online, one to one, classroom or practical sessions depending on the process and the people involved. Management system training has been more ad hoc with specific briefings and sessions delivered where necessary. As with CMS communication above, for the CMS to be effective, it is essential to ensure that staff are conversant with relevant aspects of the CMS, and time and resource is allocated for training. 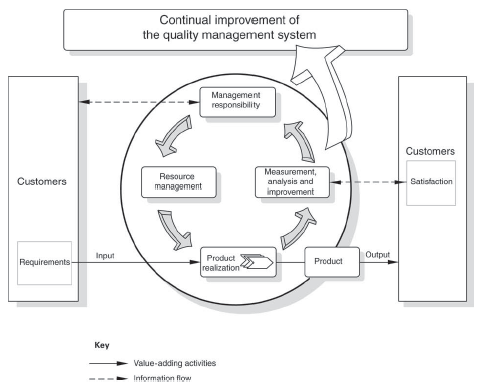 As illustrated in ISO 9001:2008 the PDCA Cycle model below (figure 7) was followed for establishing, implementing, reviewing and approving the management system. The ISO 9001 requirement for management commitment is prevalent within CRL. By using top management to successfully drive the process with communications from the Technical Director to other Directors, the profile of document review and update was raised, and the risk of having out of date documents within the management system reduced. This was invaluable in gaining the confidence of the Infrastructure Managers (IMs) who were particularly interested in the technical assurance processes and how they would address the requirements for London Underground and Network Rail works with areas such as design and engineering safety management. An important aspect of this was that the CMS mandates the documents that provide progressive assurance evidence. Documents within the CMS detail the assurance requirements to be met by the project. It also was an effective way to communicate both internally and to sponsors, stakeholders and 3rd parties’ representatives, how the integrated Crossrail team operate, providing assurance that the programme is being managed effectively and efficiently. Time bound – with a target date to focus / prioritise. At the initial stage the Delivery Strategy and top level policies were created. The Delivery Strategy demonstrated that CRL had in place the organisation, strategies, controls and resources to manage Crossrail. After this the four top level Management Plans (Level 1) were produced, these provided a description of the organisation and manner in which CRL would implement its Delivery Strategy in order to meet the Sponsors Requirements for Crossrail. The next stage was to develop the Management Plans (Level 2) for the corporate, support and specialist functions. Within these documents key processes were identified and the process owners, nominated by top management, would lead with their development and implementation. Processes were defined and mapped and in some cases further broken down where they were complex. The Level 3 detailed manuals, plans and processes could then be produced and implemented with careful attention given to processes that involved more than one directorate. Level 4 documents were then developed that were mostly detailed instructions of how to carry out an activity with associated templates for the records to be maintained. At this stage, competencies, detailed instructions, training requirements, calibration requirements for any equipment and inspection / check criteria were defined. As part of the continual Improvement cycle checks are carried out on the CMS processes to ensure that their content is being adopted. These range from informal discussion through to functional reviews or audits coordinated by the Head of Audit. These checks identify any need for improvements which are to do with either implementation and adoption, or the need to amend CMS Content. In some cases action is necessary, such as raising formal observations to the issuer and tracking of Corrective Action Reports or Audit Findings. As highlighted in Section 2, referencing the Sponsor’s Requirements, Crossrail needed to have a management system that addressed the requirements of BS EN ISO 9001 (Quality), BS EN ISO 14001 (Environment) and BS OHSAS 18001 (Safety) and these were independently checked by an external body, Lloyds Register Quality Assurance (LRQA). LRQA are the certification body who provide registration for the three standards for CRL and who carry out annual assessments to ensure that the CRL management sytems are in conformance with the three respective standards. The benefits of certification are to confirm compliance with the standards and this helped CRL to improve its products, process and service quality, productivity and ultimately helps to reduce costs. It gives the respective infrastructure managers (IMs) and stakeholders confidence that CRL has an effective management system to deliver the programme. The Crossrail (Internal) and TfL (External) audit teams check adherence to the CMS and report their findings to the Audit Committee, sponsors, infrastructure managers, auditees and line management up to CEO level. It proved beneficial to have top management fully engaged with the CMS implementation so any issues were taken seriously and that they could be relied upon to support developments and initiatives. In March 2014 due to a major transition in the project from civil engineering to rail systems, a ‘special’ CMS Review was undertaken to ensure the CMS was ‘user friendly’ and had evolved effectively to fit the new organisation structure. This was a good exercise to ensure that all documents were up to date. This involved creating a new CMS portal in line with the CRL organisation and a complete review and update of the CMS documents. It reflected the current organisation. Phase III – All other documents. This was largely a collaboration exercise with the programme teams and proved to be very effective. Throughout the CRL lifecycle the CMS was subject to continuous review and scrutiny through audits, stakeholder interest and the ongoing task of ensuring content was reviewed at regular intervals and the documents fit for purpose. Every 4 weeks a report is produced from a data export from eB into excel. This raw data is then processed to show the latest approved documents that are contained within the CMS. This report is principally used to ensure that the key eB metadata, (i.e. date effective, revision…), has been entered correctly. Data from this report is used to monitor the CMS and to measure the number of CMS documents within each directorate and the time since approval. These were set up to measure the performance of the management system with regard to review and update and to show which directorates needed assistance to expedite reviews. KPIs were issued to demonstrate progress and to focus on any areas that needed attention. CRL set a target that no document should be in existence for more than 2 years (as a minimum) without undergoing a formal review. This annual review is used to measure the effectiveness of the CMS and to highlight CMS performance and address any issues at top management level. This was set up with key personnel to facilitate a process to improve CMS performance and drive it towards World Class Levels. Brainstorming – to generate a large number of ideas quickly concerning a problem under consideration. These tools successfully promote and progress continuous improvement, in particular with highlighting areas that are effective as well as areas that need attention. A collaborative effort is needed as, in some cases, representatives from across the organisation take part. This greatly assists the respective functions as the co-operation between functions / departments helps breakdown any barriers within the CRL. Six-Sigma was also used effectively on Crossrail with a specific team set up to improve performance. Areas requiring improvement were highlighted and process improvement plans (PIPs) were agreed with top management to be tackled by Six-Sigma. The Six-Sigma approach of Define, Measure, Analyse, Improve, and Control (DMAIC) provided a disciplined method of rigorous data gathering and statistical analysis to identify sources of errors and ways of eliminating them. These were particularly effective with the document control processes; design drawing issue processes as well as with production issues with Tier 1 contractors. Crossrail is a vast and complex project that has provided the opportunity for development, and as a testing ground for new technology and innovation. As well as the vast scope and scale of the project, the complexity was increased due to the interrelationship with sponsors. CMS portal development from an early Visio model, into a process model and subsequently an online application has enabled the IT team to innovate and utilise technology with the evolution of the CMS. Rigorous testing was carried out to ensure the CMS was robust and reliable with some excellent opportunities to collaborate with the Quality Team. Transfer of the control of organisation charts to a single person, the Management System Manager, provided a direct input of organisation changes to the CMS that could easily be reflected. Retention of documents within the EDMS and linking them to the portal worked very well. Although document numbering and coding could sometimes be inaccurate, this was addressed by interrogation of the EDMS using the reporting function. An improvement would be to automate the CMS as much as possible, particularly with reporting whilst still ensuring that the eB data was interrogated for accuracy. With regard to management systems, historically it has always proved a challenge to maintain a system that addresses key requirements effectively. With Crossrail this was not straightforward. However, the CMS has evolved into a robust and secure system that is user friendly, provides ease of access, and has excellent storage capabilities. In addition an effective review, approval, revision process has helped to make the system even more efficient. Other areas that worked well were the early definition of key processes and ownership of the documents by the departmental teams, engaging top management to drive the process. It was at times difficult to maintain the momentum with document reviews. An improvement would be to instigate a regular review process at specific times throughout the calendar, creating an inbuilt and sustained ‘review culture’. Developing the CMS has been an evolving process but much has been learned along the way. Having identified these lessons, some recommendations can be provided. Map Key Processes at an early stage and at a high level before looking at the detail. Develop an effective and ‘user friendly’ management system web portal and try and automate as much as possible. Ensure the repository for management system documents is in the Electronic Document Management System (EDMS) and that they are linked from the portal so that documents are not duplicated. The CMS Portal was linked to eB (the CRL EDMS) which reduced the risk of following out of date or unapproved documents and ensured that the latest approved document was always available. Develop a coding system to link the EDMS documents to the management system web portal. On CRL a coding system was used to enable easy searching for documents in the EDMS. Ensure that the organisational evolution is co-ordinated with the management system and any organisational changes are reflected at an early stage. Establish a system to ensure that forms and templates are produced in a consistent manner. Refreshing the CMS once a day rather than in ‘real time’ enabled the CMS to run very smoothly. Due to the quantity of data in eB, a ‘real time’ search would take much longer to return results. Carry out continual review of the management system to test effectiveness and make changes. The CMS review and approval was improved by allowing ‘offline’ reviews to be carried out. Regular structured and focussed management system reviews are essential to ensure a continual review and that momentum from the ongoing review process is maintained. A more structured and consistent programme of reviews started at an earlier time in the programme would have driven the teams to adopting a more effective approach. Effective communication of any new or amended process or procedure was key to its successful implementation e.g. by briefings and training. Ensure that there is a single point of accountability and alignment between the key processes and organisational structure, for example a Management System Manager who has an objective overview of the system and defined management system responsibilities. Define clear accountability for document ownership, including keeping the documents up to date. Include a clear and simple change control process for document update. Consider using a software driven management system to replace more traditional word / excel templates. This would assist with standardisation and compliance. British Standard BS EN ISO 9001:2008 Quality management systems – Requirements. International Standards Organisation; 2009. British Standard BS EN ISO 14001:2004/Cor 1:2009. Environmental management systems — Requirements. International Standards Organisation; 2009. British Standard OHSAS 18001. Occupational Health and Safety Management (OHS). British Standards Institute; 2007. Aram Stirzaker is the Programme Quality Manager at Crossrail. He is responsible for the development of all Crossrail quality management systems, providing technical support and conducting Contractor Performance Assurance Assessments. 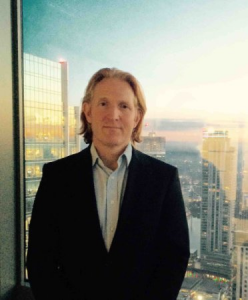 He is also involved in initiatives such as World Quality Week and provides quality support at Canary Wharf Station. Aram started his career as an Engineer on the Channel Tunnel Rail Link and progressed into Quality Management. He now has over 25 years experience, working with both client and contractor, principally on major infrastructure projects within the UK including HS1, Jubilee Line Extension, A35 Bypass and Heathrow Express. He has been with Crossrail since January 2014.